According to Thomas Cook, the revenue for New York excursions was up by 190% after using virtual reality. That’s an impressive number, and you, a marketing team from a travel agent or a real estate or any related field, might be wondering how they can do that. In this post, we will show you how some travel brands implement their VR marketing attempts. As the first travel agency, Thomas Cook is also the first travel brand who uses virtual reality to boost their sales. Launched a virtual reality application where people can virtually visit several places, such as Egypt, Cyprus, New York, Greece, and Singapore. Delivered in-store virtual reality experience for customers using Samsung Gear VR. Enabled the virtual reality application for Android and iOS, which can work with cardboard VR viewer, for an outside in-store experience. In the first 3 months, it generated flights and hotel bookings totalling £12k ($17,500) in UK and Germany. The revenue for New York excursions was up by 190 percent. Filmed a 360 video in Mexico. It would allow customers to feel like they were walking along cliffs, sitting on beaches, and swimming with the dolphins. Provided a branded virtual reality glasses that works with Android and iOS. 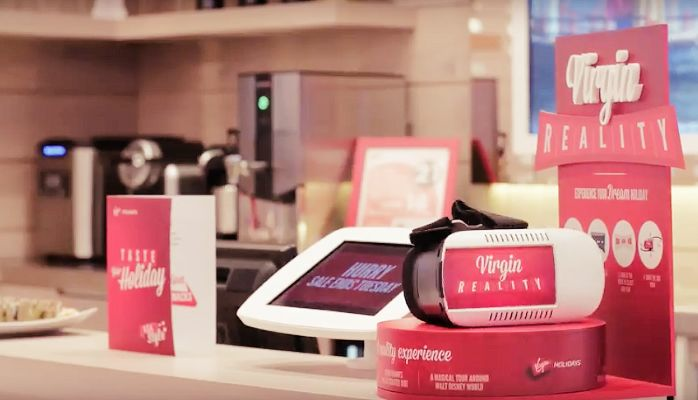 Delivered in-store virtual reality experience for customers using that branded virtual reality glasses. Customers responded by increasing their propensity to buy. No exact figures, yet the results were ‘phenomenal’, said Virgin. Took 360 panoramas and videos in the best destinations in Abu Dhabi. Delivered virtual reality experience to the booth of Abu Dhabi Tourism Authority using Oculus. No exact numbers, yet it became one of the highlights booths at the event. So, what should you do for your first VR marketing attempt? Learning from these travel brands, there are six things you can do with VR marketing for travel brands. 1. Capture a 360 panorama or 360 video for the places you promote or offer. If you’re a part of tourism authority of a certain country, you can take the best destinations, the secret places, the landmarks from your country, like what Visual Experience company, the first virtual reality company in Gulf Council Cooperation region, did for Abu Dhabi Tourism Authority. If you’re simply a travel agent, you can take the most visited places, the most breathtaking places, or the most potential places to be visited. Such experience will give your customers a try before you buy experience. 2. An interactive 360 panorama. Take a look at what Google Earth VR did. People can interact with the places by flying and moving to the angles they want. As this was meant to be a real estate VR project, such method could also apply in VR marketing for travel brands. P.S. The shoots above are our project for Sabic: Home of Innovation. 3. A branded virtual reality glasses. If brands matter to you, then here you go. 4. Place your virtual reality glasses at your booth or at your office. Instead of showing them traditional pictures and videos, you can let them try the place before they buy the ticket. But just like what Thomas Cook explained: The revenue for New York excursions was up by 190 percent, and flight and hotel bookings went up by £12,000 ($17,500) from people making a purchase after the experiencing virtual reality. If you’re looking for an affordable VR marketing way, BeThere Book: Travel Edition is a perfect fit for your travel brand. BeThere Book: Travel Edition is a virtual reality glasses that integrates the VR traveling content. All you have to do is scan the QR code inside and choose the best traveling VR content for your customers. If you want to have a branded virtual reality glasses that can integrate your travel brand’s information and your own virtual reality content, the solution is open with this VR brochure. Where can you find VR company that can implement your VR marketing idea? You can find many various VR companies. But if you’re looking for the one who’ve experienced with a travel agent and got an award for what they did, welcome, you’re already here. We, Visual Experience, have been working with Abu Dhabi Tourism Authority. Our VR app, Makkah Window, got an award by UNESCO. We also have been working with several big companies and organizations, such as Samsung, Sabic, King Abdullah University of Science and Technology, and many more. So, what are you going to do for your first VR marketing attempt? Well, it seems somebody will achieve a new level of successfulness. ← Bye, Gym. These 12 VR Fitness Games Will Get You in Shape from Home.